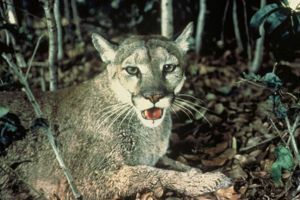 Panther (Greek πάνθηρ, all-hunting) is the byname given to several species of large wild cat of the genus Panthera, and usually given in reference to the leopard (Panthera pardus); the term has also been used to some extent on the lion (Panthera leo), tiger (Panthera tigris), jaguar (Panthera onca), and the mountain lion or puma (Puma concolor). The name black panther is given to both the leopard and jaguar as a result of an uncommon melanistic gene which gives such cats an all-black appearance. This page was last modified on 27 January 2010, at 12:06.